Peter H. Niewiarowski is an ecologist and evolutionary biologist. He is particularly interested in geographic variation in the life history traits of lizards. After earning his Ph.D. in 1992 from the University of Pennsylvania in Philadelphia, he was a Post-doctoral Research Associate at the University of Georgia's Savannah River Ecology Laboratory (SREL) in Aiken, SC. Using a variety of experimental techniques (including reciprocal transplants, supplemental feeding and laboratory common gardens) and comparative data on biophysical environments, his thesis work focused on revealing the relative contributions of genetic and environmental sources of variation in life history traits of fence lizards. During his tenure at SREL while developing a spatially explicit population dynamic model of temporary pond breeding amphibians, Peter used large scale field enclosures to test the effects of forest management practices on the demography of mole salamanders. 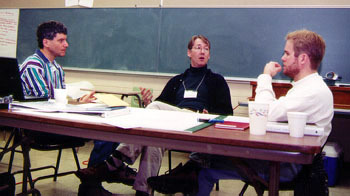 Peter joined the faculty of the University of Akron in 1995 and teaches Vertebrate Zoology, Herpetology, Advanced Ecology, Field Ecology and Principles of Biology. His research currently includes life history variation and physiological ecology of lizards, long- term demographic study of amphibian populations in Ohio, and computer simulation modelling of population dynamics. David McConnell is an Associate Professor of Geology at the University of Akron. He is in his tenth year of teaching at Akron. He has directed the Geology department's Field Camp for six years. The program teaches 20-30 students each year the basics of field geology for five weeks in South Dakota and Wyoming. One of David's current interests is the use of the Web for instruction in introductory-level courses, especially the concept of virtual field trips. He teaches environmental geology, natural science geology, and structural geology. His research interests include rock deformation, specifically the evolution of fault-related folds. Dr. Londraville is a cell physiologist who studies how fish maintain cell function when challenged with different body temperatures. He earned his Master's degree in 1989 and a Ph.D. in 1994 (Zoology) from the University of Maine, Orono. His thesis work involved characterizing the structures and function of fat-binding protein in the hemoglobiniess Antarctic icefish. After earning his doctorate, he was a postdoctoral associate in Dr. Barbara's Block's lab at Stanford University's Hopkins Marine Station. He joined the faculty at the University of Akron, Dept. of Biology in 1996, where he teaches Ichthyology, Principles of Biology, Cell Physiology, and Structure and Function of Proteins. Currently he is funded by Ohio Sea Grant to develop an antibody test for the hormone leptin, in hopes of reducing overwinter mortality in largemouth bass fingerlings.